It’s not quite spring but we decided to clean behind the fridge anyway. The fridge hasn’t been moved since it was installed back in 2012 and as you know it works on the principle of extracting the heat from inside and expelling it via a radiator on the back. If the radiator gets clogged up with dust then the fridge has to work harder. That means the domestic batteries work harder. The first step was to turn off the 12V to the fridge and remove the contents. I then “jiggled” the fridge out and turned it 90° so Jan could have access to the back and the now empty compartment. Hummmm Some dust on the top! We started the boat engine and then Jan set to work under supervision with the vacuum cleaner. I had anticipated more dust inside the compartment. The top pipes are the hot and cold to the toilet and shower. The big one is the toilet return and the two lower pipes are for the central heating finrads. The ”breathing holes I drilled at the rear allow cold air to be drawn from the bilge in an effort to keep the fridge radiator cool. The idea is this improves efficiency and reduces the 12V demand. If you look closely at this next photo you can see all the airborne dust I created when I decided to ”help”. This is why I should never help with housework! The next small task was to check the phone internet allowance. You may recall I wrote 18 days ago that we only had 429Mb left of our monthly 12000Mb allowance. To prevent us from running out of data I turned off the mobile phone ‘hotspot’ and instead connected it to the Zoom router via a USB cable. This stopped us from using our tethering (hotspot) data allowance and switched us over to the phone unlimited data allowance. I checked the hotspot data allowance 3 days ago and it was still on the original 429Mb. So using the Zoom router connected to the phone gives us unlimited data. Whilst this might seem great we did notice using this setup did result in some “drop-outs”. So the Zoom setup didn’t appear to be as reliable as the phone hotspot. 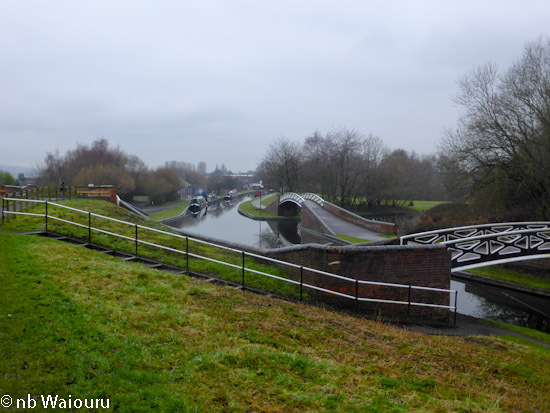 We had planned to move to the secure moorings at the Dudley Canal Museum and hire a car this weekend to visit Jaq & Les but those plans became obsolete (well more delayed). Instead we turned in the opposite direction at Dudley Port Junction and promptly came upon ice. Fortunately there was a coal boat approaching from the direction we were heading so we cruised very slowly until it passed leaving us with a clear channel. The ice had gone by the time we reached Pudding Green Junction (just love the names). We had the canal to ourselves and the trip into Birmingham was uneventful. Winter cruising means there are far fewer boats on the move. The New Main Line took us under the busy M5 Motorway bridge with the Old Main Line aqueduct beyond. Jan thinks the design of the M5 bridge is quite artistic. 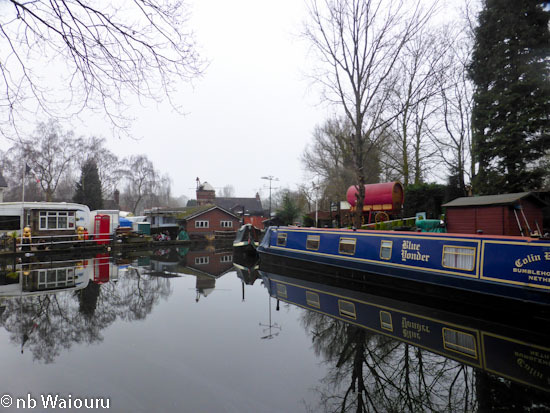 As we got closer to Birmingham Jan started to express concerns that we may not find a vacant mooring. It turned out she was right. OK, I jest! This is the emptiest we’ve seen the moorings in Birmingham. We cruised around to the water tap at Cambrian Wharf topping up the water tank before moving onto one of the many vacant mooring at the wharf. Whilst doing this we noticed nb Jennifer Eccles we met the owners In Sheffield last year and we last saw them on the Chesterfield Canal. We’ll be here for the weekend waiting out the cold snap coming. Our fortnight at Bumble Hole would have been up on Thursday and the weather forecast for that day didn’t look promising. So the breakfast decision was to move today. I went out to fill the water tank discovering the tap was frozen. That problem was simply solved by pouring boiling water over the outlet. Things then went seriously downhill when Jan read on Jaq Biggs Facebook page that Les (nb Valerie) had passed away just after 9am. 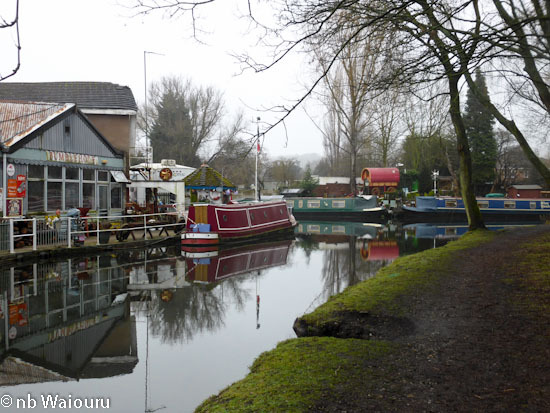 After reading several days ago that Les had been admitted to a hospice we’d been planning to move to the Dudley Canal Museum and hire a car to visit both of them. We’d started reading Les’ blog a number of years ago. Here was a solo boater who was passionate about the canals, but who also appeared to be somewhat lonely. His blog evolved into the story of a long range romance leading to love and a new partner. Just when you might expect them to live happily ever after Les was diagnosed with cancer. We read how Jaq fiercely fought in his corner and Les appeared to be slowly recovering. Unfortunately that insidious cancer returned and this time Les & Jaq couldn’t defeat it! Each time we’ve met Les he was always cheerful and happy to share his knowledge of the canals. One couldn’t but help it be impressed with his compassion and inquiring mind. Les’ hard boating days are over. Now all the locks will be in his favour, the days will be sunny and there will be no shortage of moorings. Our thoughts are with Jaq. Whilst we’ve been reading of ice in other parts of the canal network we’ve been experiencing milder weather here at Windmill End. Perhaps the “wintering over in Birmingham” theory was correct? Today I went for a canal walk. Usually we are cruising which means you frequently see things from a different perspective. 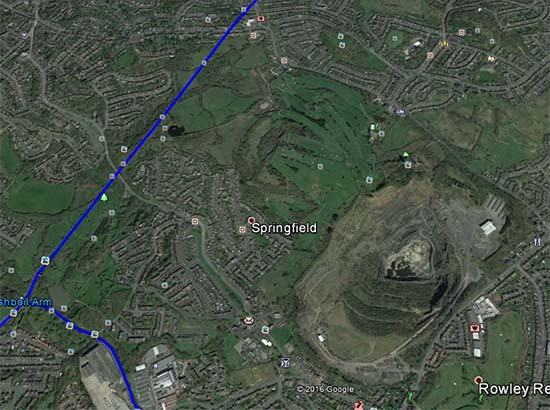 It was a circular route which first took me away from the canal to Old Hill. Along the way I was surprised to see this behind the local Gate Hangs Well pub. Yes, I know it’s an old shipping container! What actually surprised me was this…..
Back at the end of the last century I was managing the Sydney Rail Freight Terminal and the two young (well 10 years younger than me) sales managers at the terminal left to create a shipping container hire business. They named it Royal Wolf! So seeing a Royal Wolf container behind a pub in the Black Country was rather unexpected. The towpath walk back to Waiouru reinforced the canal’s link with the area’s industrial past. The arm at Withymoor Island was obviously part of a wharf and the road at the end is named “Railway Sidings”. Further towards Gosty Hill all that remains of another arm is the bridge. The area beyond the bridge to the left is being redeveloped as residential housing. 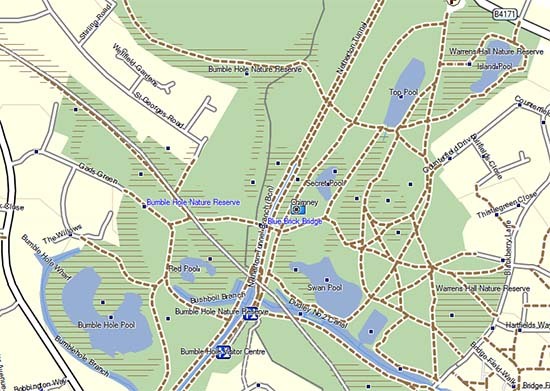 Closer to Windmill End is a rectangular basin which now forms part of Warrens Hill Nature Reserve. It must have been a busy location in its day. Beyond it and to the left, is that high knoll I walked to several days ago. My guess is the knoll was formed using the ash from the adjacent Cobb Pump House. Many of the trees have been severely pruned in this area. I wonder how long it will take for local boaters to realise there is plenty of available free solid fuel? Looks like tomorrow is going to be a lovely day! I’m going to add some final comments about those 19th century relatives and then change the subject. It would appear I managed to identify the wrong woman as my maternal great grandmother. Elizabeth Crallan was my great grandmother’s sister! I found a newspaper article which mentioned the Crallan’s. Bush Advocate, 30 May 1904, Page 3 GOLDEN WEDDING. A pleasant family gathering took place yesterday, at the residence of Mr and Mrs Crallan, senr., the occasion being the celebration of Mr and Mrs Crallan's golden wedding. Mr Crallan came to New Zealand in the year 1859, in the good ship "Regina," landing at Lyttelton on December 16th, that day being the 9th anniversary of the Canterbury Province. ; Mrs Crallan joined her husband three years later, having come to the colony in the ship "Chariot of Fame." They spent about three years at the Church Bush, near Kaiapoi, Mr Crallan being at that time engaged in pit sawing. Some time afterwards be shifted to Oxford, in North Canterbury, where he remained for twenty years. 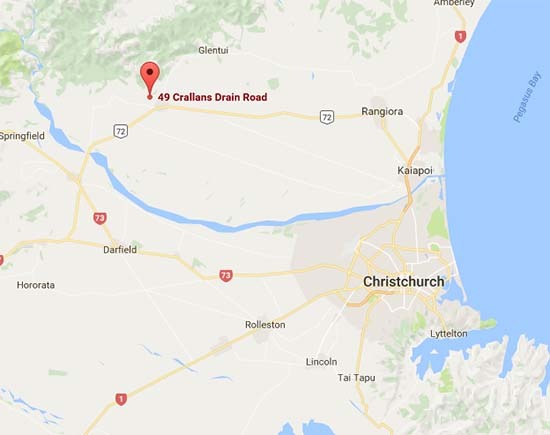 Mr Crallan's next shift was to Dannevirke, where he and his son are well known in sawmilling circles. We regret to say that Mrs Crallan's health has not been good for some years, but fortunately Mr Crallan is still hale and hearty. So Elizabeth Crallan (nee Richardson) couldn’t have come from a wealthy South Island sheep station family because she married James Crallan before he left England! Having the name of the ship Elizabeth used to reach NZ enable more information to be found. The Chariot of Fame was a three-masted, square-rigged 'medium clipper' ship, built at East Boston, Massachusetts, by Donald McKay, for Enoch Train & Co., Boston, for their White Diamond packet line between Boston and Liverpool, and launched in April 1853. Dimensions 220'×43'×27'6" and tonnage 1639. For the first year the Chariot of Fame sailed out of American ports as a packet vessel. After this the vessel was chartered by the White Star Line of Australian packets and made a number of good passages to Australia from England in 1854 and 1855. In 1862 the vessel was sold in London and the vessel came out to Australia and New Zealand on several more voyages. She London 29 October 1862 and arrived in Lyttelton 29 January 1863 with 430 Government immigrants and 30 passengers. So my great-great grandmother arrived in New Zealand as a government assisted migrant with her five year old daughter Elisabeth. They weren’t fare paying passengers, and her profession was Domestic Servant. Well that resolves the “wealthy family connection fable”! This means my great grandmother must have been born in New Zealand. She was Jane Elizabeth Crallan. More digging around on the internet and I found a photo of her headstone revealing she was born in 1867 and died in 1944. It means my grandparents were born in the same year. Next I rediscovered the two digital copies of the photos my mother had of her grandparents. And the first bus in Dannevirke which was owned by Thomas Mills. He is sitting in the front passenger seat. OK…. enough of the boring family stuff. Today was “Boys Toys” day and I was up early ready to make the dash walk to Lidl when it opened at 10am. Readers imagine my horror when I arrived to find the car park full of males either entering or leaving the supermarket. I was convinced they were all there buying the items I wanted. Fortunately with a little jostling and shoving I managed to seize everything I wanted. Clockwise from top left. Soldering iron station, dremel with attachments, right-angle drill attachment, diamond core drill bits, case of assorted of dremel attachments. If you read yesterday’s blog post you might have noticed the christian names of Thomas Mander Mills’ sister Annie who died on the voyage. Two of her names come from the ship. (Annie Laty Banfield Invererne Mills. So Elijah and Sarah made their way to Dannevirke with their nine surviving children. Actually they went on to have three more. 12 children in 19 years. It must have been very difficult and expensive try to feed, cloth, accommodate and educate such a large family whilst simultaneously attempting to establish yourself in a new land. From this point I’m relying on my mother’s memory. The struggle for the family must have become too difficult because after attending Woodville primary school Thomas was sent to live and work as a farm boy on the property of Mr & Mrs Thomas Hunter's station, at Porangahau. They had no children and must have been impressed with young Thomas because instead of placing him in full-time employment on the farm they paid for him to get a secondary education as a boarder at Te Aute College, Pukehou. Te Aute College was established by the Anglican Church in 1854 with the objective of educating Maori boys for attendance at university. A number of its former pupils have gone on to have distinguished careers. Not only did Thomas gain an excellent education but he also learned to speak Maori and understand Maori culture. My mother could remember walking through Dannevirke with him and watching her grandfather hongi and speak Maori with local tribal elders. Apparently Thomas proved to to have a natural ability of training and working with horses. After his formal education had been completed Thomas found employment working with horses. 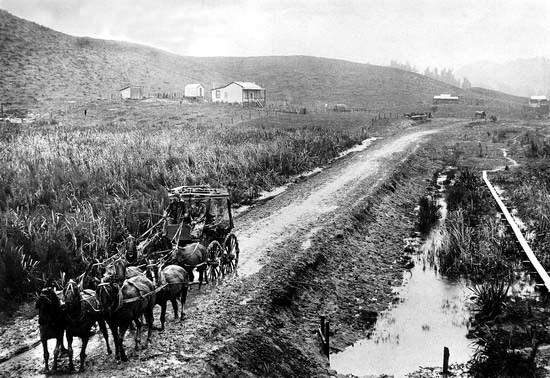 At this time most of New Zealand’s transport was by sea or river. Main population centres were being connected by rail, although the rugged nature of the country made this slow. Minor inland locations were connected by rough unsealed roads which were used by bullock carts. Passengers and mail travelled by horse drawn stage coaches. 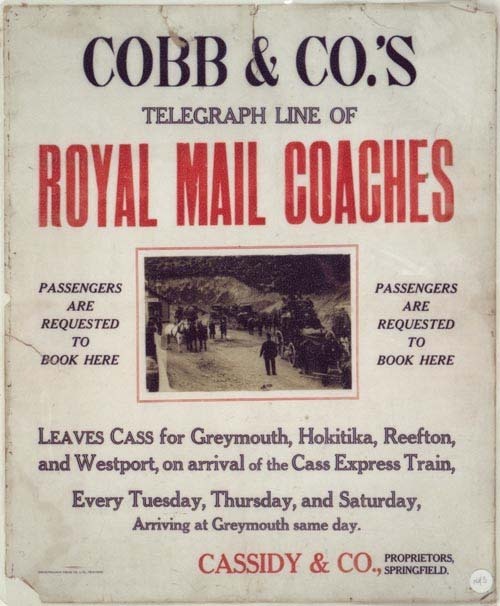 The largest company was Cobb & Co (of wild west fame) and Thomas obtained employment with them as a stage coach driver. Meanwhile my great grandmother was living the lonely life of the sole daughter of a wealthy sheep station owner. She had been educated to be a “young lady” with a personal maid and domestic servants to look after her every need. Well not quite all her needs! She wasn’t allowed to fraternise with the children of the station’s employees. The weekly stage coach arrives being driven by a young handsome (so that’s where I get it from), personable, educated, and ambitious male of the right age. It wasn’t long before raging hormones took over! Elizabeth Crallan decided Thomas Mills was the most promising prospect she had seen to date and she wasn’t about to become a wallflower. Despite her parents threat to “cut her off” she married Thomas. 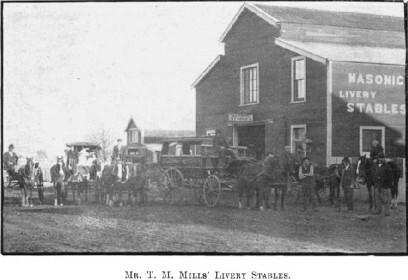 MILLS, THOMAS MANDER, Livery and Bait Stable Proprietor, Barraud Street, Dannevirke. This business was established by the present proprietor, in January, 1894. The premises consist of commodious stables, up-to-date in every respect, containing over fifty stalls and loose boxes, and accommodation for vehicles. 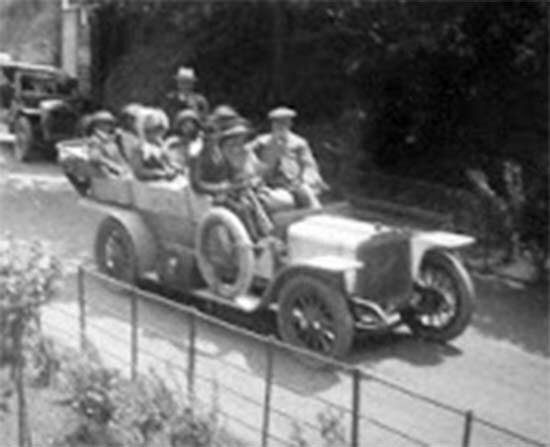 Five coaches, two 'busses, a waggonette, a landau, two waggons, three double buggies, and a large number of single buggies and gigs are employed in the business; and Mr. Mills is assisted by a staff of twelve experienced persons. Mr. Mills also holds the Government Weber-Herbertville mail contract, and in conjunction with his business farms 140 acres of good grazing land. Mr. Mills is a member of the Dannevirke Jockey Club, the Hawke's Bay Agricultural and Pastoral Society, and the local Lodge of Foresters. Having been raised a a lady, Elizabeth was determined to play her part as the wife of one of the towns most important businessmen. She didn’t have a maid so her daughter, Edna was both trained as a lady and learned to assist her mother dress in the capacity of a maid. Elizabeth was a leading figure in the local woman’s temperance movement, although my mother can remember she routinely drank a “Hot Toddy”. Obviously purely for medicinal reasons! Thomas was a progressive and by the turn of the century he had replaced the business horse drawn stage coaches with the new fangled automobiles. I can remember my mother showing me a photo of one of his royal mail coaches. It looked very similar to the one below, although with another row of seats. By the 1920’s he was no longer involved with horses and instead selling American made Packard motor cars. He had also established a garage and service station. The Mills service station still exists in Dannevirke. Thomas died in 1945 and Elizabeth a year earlier. Now the genealogist in the family shoots holes in the story. I can’t find any evidence of Elizabeth Crallan’s family owning a sheep station on the Wairarapa Coast. Jan has found Thomas and Elizabeth’s wedding certificate and established her parents were James and Elizabeth (nee Richardson) Crallan. In 1859 James arrived in New Zealand from Westmoreland, UK on the Regina to join the NZ Gold Rush in the South Island. He was a sawyer by trade and after unsuccessfully trying to get rich quick attempting to find that elusive gold he reverted to his trade moving to Oxford in North Canterbury. Somewhere along the way he met and married Elizabeth. James must have been quite a good sawyer because a local Oxford feature was named after him. The Crallan Drain! He obviously wasn’t always responsible as Jan found a court record showing he was fined £5 for being drunk and disorderly. After 20 years in the South Island he moved the family to Dannevirke and established a sawmill. This would have been about the time the government started to clear the Seventy-Mile-Bush. James and Elizabeth had two sons and a daughter (Elizabeth). He died in 1914 aged 88 and is recorded as a respected citizen of Dannevirke. It would appear I cannot claim to be related to a wealthy family that owned a large sheep station. However I can claim to be related to a drunk who had a drain named after him. Perhaps this is my genetic connection to canals? It’s also possible my mother mixed up her generations and it was Elizabeth Richardson who came from a wealthy sheep station in the South Island? Jan has been doing some further research on my ancestors and that information; combined with some information told to me earlier by my mother; has enabled me to piece together how her side of the family arrived in New Zealand. The first colonists arrived in NZ during the 1840’s and were mostly wealthy English or Scottish settlers who established large sheep stations on tracts of land near the Coast. Communications inland was very difficult and these settlers relied on coastal shipping. Any movement inland invariably meant either using the few rivers or following the tracks created by the local Maori. 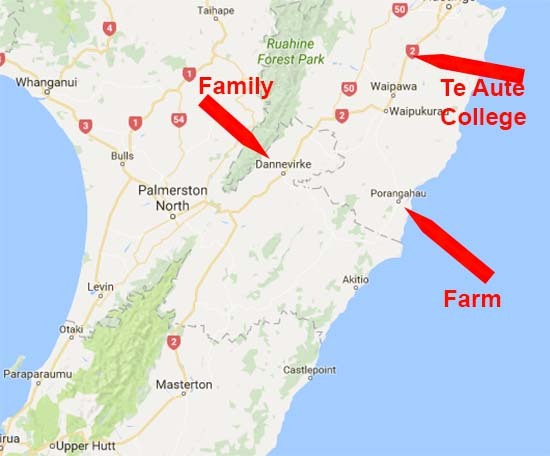 My great-grandmother came from a wealthy sheep farming family on the Wairarapa Coast. There is a line of high hills (they would be known as mountains in England) known as the Tararua and Ruahine Ranges running up the centre of the southern half of the North Island. The area to the east of this range was heavily forested and known as the Seventy-Mile-Bush being forty miles wide and seventy long. This was notorious for being remote, inhospitable and mosquito-infested. By the late 1860’s two major events were occurring in NZ. The government of Premier Julius Vogel was attempting to redistribute land into small holdings by breaking up the large sheep stations and the country was in a financial recession. Vogel’s economic plan was for the government to borrow it’s way out of the recession. To achieve this he needed to provide more land and more settlers. The government decided to clear the Seventy-Mile-Bush for farming. They recognised hardy settlers with the necessary skills would be required to clear the forest and process the lumber. The government sought settlers from the UK, Canada and Scandinavia. My great-grandfather’s family were from Oxfordshire and took passage to NZ on the Invererne which was chartered by the NZ Shipping Company. The ship sailed from London on 21st November 1873 arriving in Napier on 8th March 1874 after a voyage of 107 days. She carried 240 adults and children. Sixteen children died of Scarlet Fever during the voyage. The majority of the passengers were Danish. Denmark had been defeated by Prussia in the war of 1864 and many Danes were anxious to escape life under Prussian occupation. The Invererne had previously sailed under the name Atlanta Banfield and had been condemned. The new owners conducted repairs and she made three trips to NZ before hitting a reef and sinking off the coast of Java (Indonesia). After disembarking, the Danes made their way inland to the Norsewood -Dannevirke area where earlier Norwegian and Danish settlers had established themselves. So how did my great grandparents meet? Well that’s actually a more interesting story. Today the cloud ceiling was high enough for the transmitter masts on turners Hill to be visible so the walk was definitely on. However the first thing I noticed when getting of the boat was the folding gangplank had moved. there was no wind last night but I do remember the boat rocking slightly after we had gone to bed. The person who attempted to remove the ladder must have got the mat it rests on caught under the lip of the handrail. I know from my own experience that the ladder is sufficiently heavy that to remove it you need to stand on the gunwale. That would have seriously rocked the boat and the person must have decided not to do that. All that has been taken is a length of our old centreline. 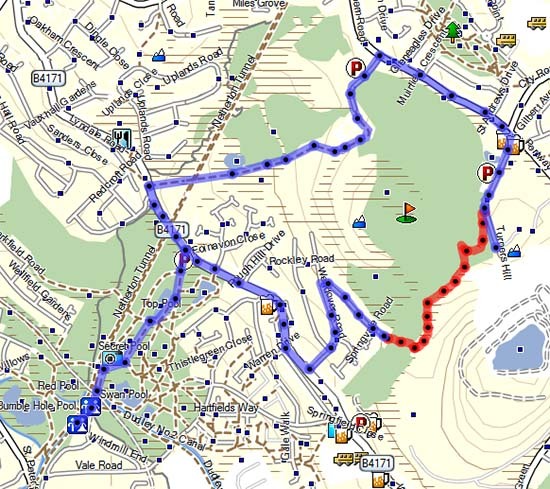 I had previously planned the route to the masts on Turners Hill using the Open Street Map (OSM) and already noted the route would have to be via the other side of the hill. The route took me up through Warrens Hill Nature Reserve. This area has a number of pools. Bumble Hole Pool is a former clay pit and I assume the other pools were also former clay pits. My guess is the clay was used to make bricks? 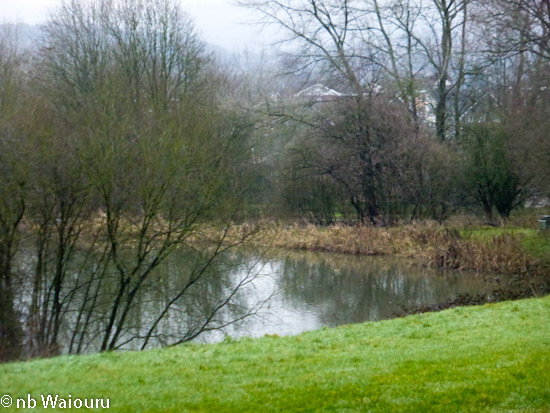 Discovering the public footpath through Dudley Golf Course resulted in a shortcut back to the boat. 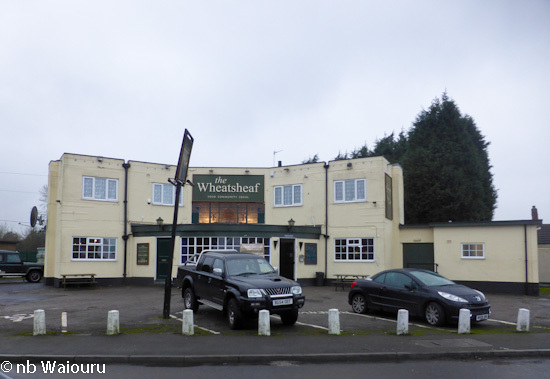 The Wheatsheaf pub is located on the corner of Oakham Rd and Turners Hill Lane. I only mention this because there is another pub opposite which I missed. It’s name is more relevant to the area. More on that later. 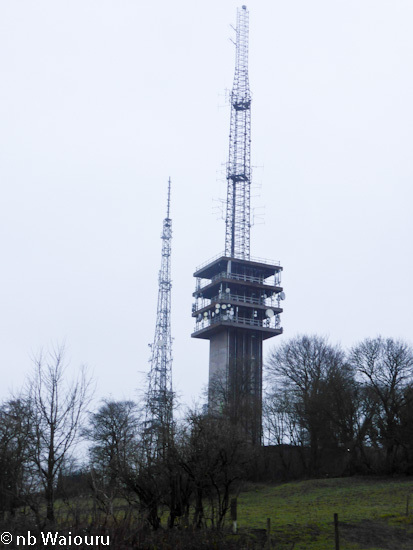 The two Transmitter Masts are at the top of Turners Hill which at 271m is the highest ground in the West Midlands. The Transmitters consist of a free standing steel lattice structure. The No2 is 60m high and has a concrete base. They both broadcast radio so there’s no point in aiming the TV aerial at them! Thick vegetation prevented me from visiting the adjacent gaping hole of the former Edwin Richards Quarry. You can see the size of the former quarry in the above Google Earth photo. Originally there were three quarries. One has been used as landfill and is now a golf driving range. The other two were combined to form the pit in the above photo. Quarrying finished in 2008 and the current plan is to use the abandoned pit as landfill. The quarries produced a local stone known as ‘Rowley Rag’ and was primarily used for road construction. That pub I missed opposite The Wheatsheaf was named the Rowley Rag. I detoured on the way back to Waiouru finding a high knoll in Warren Hall Nature Reserve which had clear views to the south. I was about to walk down off the knoll when I noticed the erosion immediately in front of me. 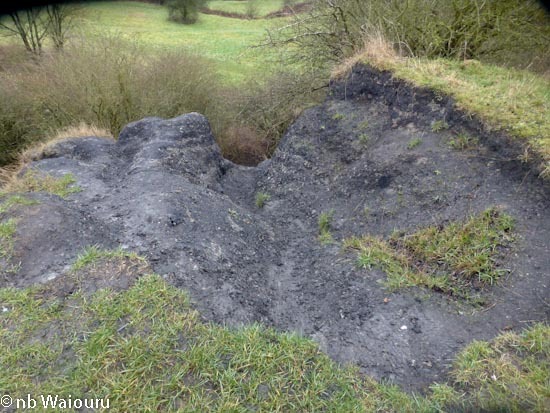 It appears this large knoll is artificial being made from ash? The local flying wildlife must have an inbuilt clock. The community run cafe beside the canal at Bumble Hole doesn’t open every day but without fail you can hear the sound of birds landing on the water outside the cafe just before opening time. When the cafe opens one of the first tasks is to throw all the old bread onto the towpath where a feeding frenzy takes place. Occasionally there is a delay in the opening time which can cause some confusion. Another day of low cloud so I only went on a short walk to Lidl and Aldi for a few essentials (Wednesday magazines). Later in the morning Sandra and Barry (nb Areandare) visited for a coffee and conversation. Hopefully the visibility will improve tomorrow and I can go for a walk to the transmitter towers. Yes there have been no posts for the last two days. Well nothing happened! We sat inside the warm boat staying out of the rain. The only interesting thing was the connection between the phone and Zoom router continued to work giving us internet coverage and we’re not using any of our ‘Hotspot’ data allowance. 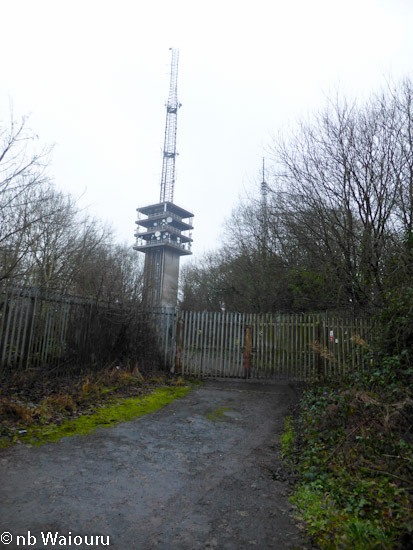 Low cloud today meant there was little purpose in walking to the transmitter towers on Turners Hill as there would have been no visibility. Tomorrow’s weather forecast is for continued low cloud which will further delay the walk. 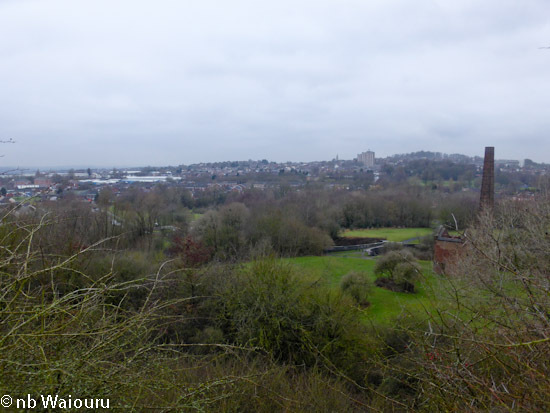 This afternoon I went for another local walk around Bumble Hole and then to Netherton. 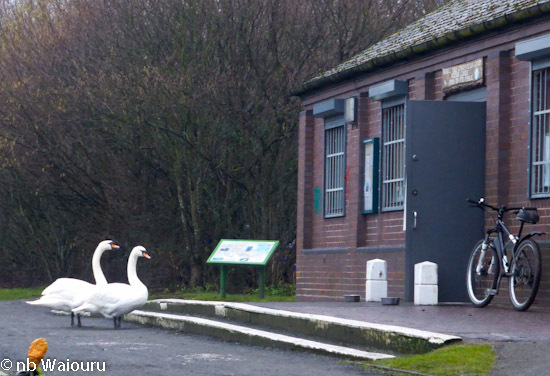 The original plan was to visit the listed crane at Bumble Hole Wharf. The anticlockwise walk took me along the alignment of the now abandoned canal to reach the wharf. 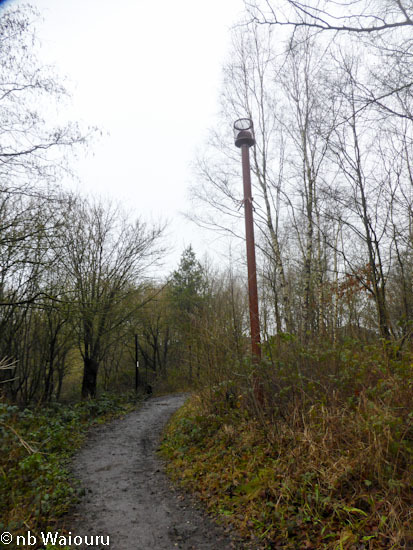 I noticed there were high round steel poles along the route. 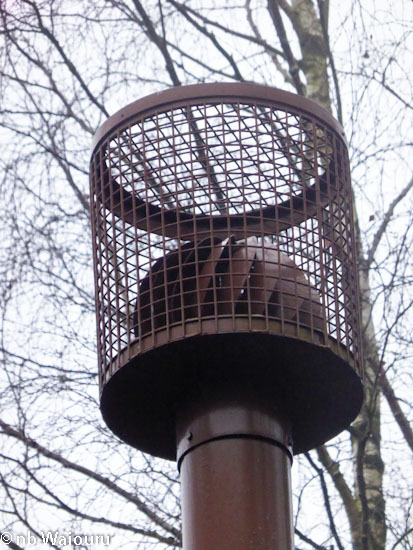 At the top of each pole there was an extractor fan enclosed in a cage. I wonder what purpose these serve. Gases from landfill? Bumble Hole Wharf was a surprise. I hadn’t expected to find moored boats! There was no sign of the unusual crane and I’ve since read it was removed in 2002 as it was urgently in need of refurbishment. However I did notice the formed windmill at the wharf. 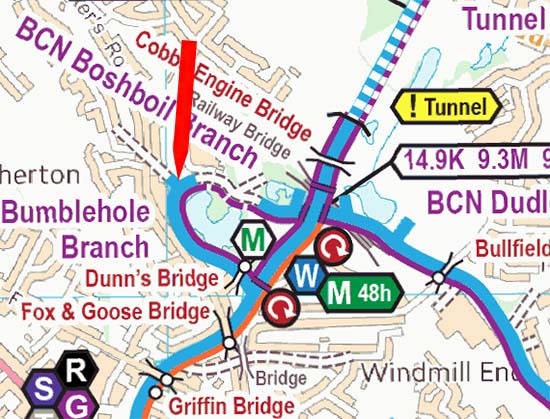 If you look at the map above, the now partially abandoned loop is actually the original route of the Dudley N02 Canal, which was subsequently shortened by a new cut. The junction is known as Windmill End. 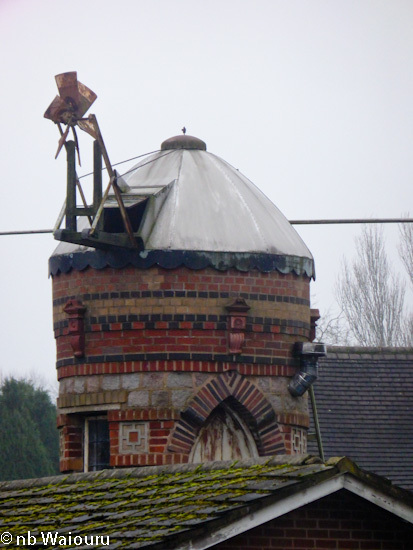 I couldn’t find any information regarding the windmill. From here the walk took me uphill to Netherton. Wikipedia has some interesting information regarding Netherton during the industrial revolution. In 1852 an inquiry into the sewerage, drainage and supply of water was carried out, reporting to the General Board of Health. Its conclusions were very damning for Netherton. A typical comment was: 'Old Netherton Town, Mr. Thomas Woodall's buildings.- Drainage very horrible, with privies and piggeries as usual, and no pavement. Procure water from a horse-pit nearly half a mile, and it has to be carried up hill, mostly by girls, in little pails of about three gallons, on their heads. This was a bad place for cholera'. 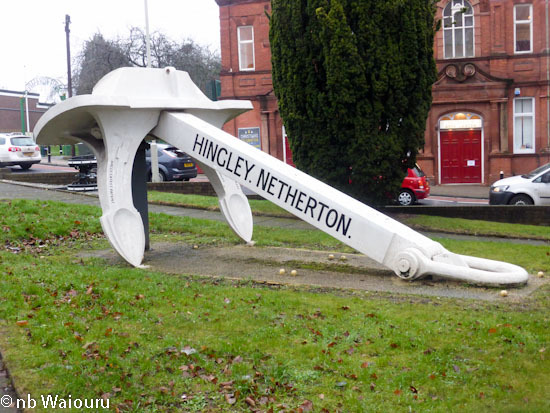 Amongst other things Netherton was known for it’s chain and anchor manufacturing. This was done at the Hingley & Sons foundry. The anchors for the Titanic were cast here and a replica anchor can be found in the centre of the old market place. Apparently the anchors weighed 15½ tons each and it took 20 shire horses to move each anchor to the railhead at Dudley Port. The primary reason for walking to Netherton was to check the Old Swan pub as a potential Sunday lunch location. The pub is quite famous locally. The current building dates from the 1860s but there has been a pub on the site since at least 1835. It has been known as Ma Pardoe's since the interwar years, as its long-term landlady was Doris Clare Pardoe (born 1899) who owned it until her death in 1984, when she was 85 years old. Such was its fame among the lovers of real ale, that when the pub came up for sale in 1985, a company was set up by CAMRA to purchase and run the pub. Although this company was short-lived, the pub and brewery survived and it is now one of only a handful of pubs in the West Midlands that still brews beer on its own premises. As well as for its beer, the pub is also known for its decor including a ceiling decorated with vitreous enamelled iron plates. The pub has been designated a Grade II listed building.